Formula E ended this season with a big bang: Jean-Eric Vergne secured the victory ahead of Lucas di Grassi and Daniel Abt, who fetched the teams’ championship for Audi Sport ABT Schaeffler. This New York City E-Prix has come a long way. Due to extreme weather conditions right after qualifying, it looked like the race might be in danger of getting cancelled. Fortunately, the situation calmed down in time for the finale race of the season and so the fans of the series got the official goodbye to the Gen1 cars that they deserved. 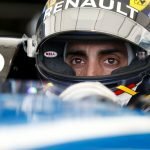 The situation at the very top looked a lot like the day before with Sebastien Buemi (Renault e.dams) on pole-position. But once the red lights went off, it was newly crowned Formula E champion Jean-Eric Vergne (TECHEETAH) who got the better start from P3 and went past the Renault e.dams in turn one. His teammate Andre Lotterer was also putting a lot of pressure on the season two champion, but Buemi managed to defend his position against the German. Right behind the trio, Lucas di Grassi (Audi Sport ABT Schaeffler) overtook his teammate Daniel Abt, who did not get off the line well and temporarily dropped to P7. On lap four, Lotterer squeezed himself past Buemi for P2, making it a TECHEETAH double at the front. Nevertheless, things should get worse for the new Formula E champion and his teammate as both of them were under investigation for jumping the start. While Vergne was lucky and escaped a penalty, Lotterer received a ten-second stop and go for his jump start and he served his penalty on lap twelve. Even more unlucky were the DRAGON squad. 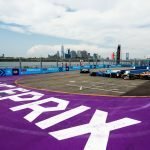 Celebrating its home E-Prix in New York City, the team was hoping for some solid points this weekend and while their performance looked promising in qualifying, they could not turn their strength into a good result. First, Jose-Maria Lopez ran into problems with his car, stranding on track which caused a full course yellow. When the drivers slowed down, NIO Formula E driver Luca Filippi crashed into the back of Antonio Felix da Costa (MS&AD Andretti) and then took of Jerome d’Ambrosio right behind him, turning DRAGON’s weekend from bad to worse. When the green flags were shown, di Grassi was immediately putting pressure on Buemi and managed to overtake the Swiss within a few seconds. 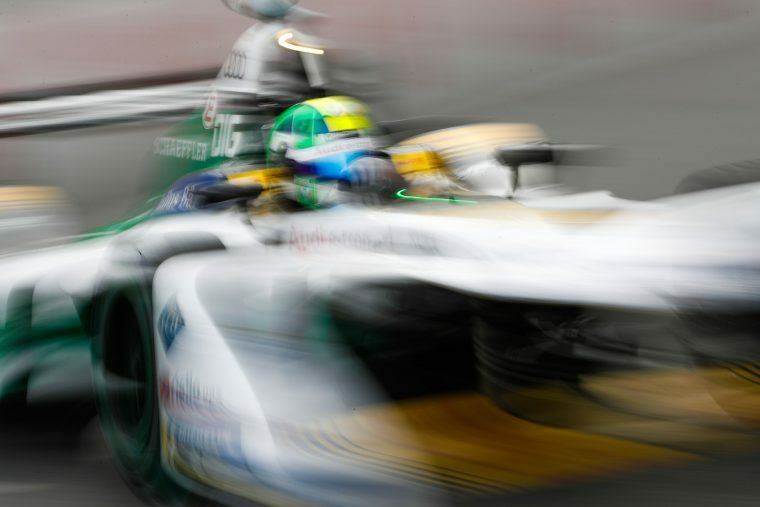 Two positions further down the field, his teammate Abt also squeezed himself past Nelson Piquet JR (Panasonic Jaguar Racing), moving the Audi Sport ABT Schaeffler team closer to securing its first ever Formula E championship win. The duo then started pursuing Vergne and Buemi respectively, hunting down not just the title but another double-podium for their team. While di Grassi closed the gap to Vergne, but did not find a way past the champion just yet, Abt found a way past Buemi on lap 19. The German then was the first driver to change into his second car on lap 23, one lap before Vergne, di Grassi and Buemi. Nevertheless, the German managed to stay ahead of Buemi and right behind teammate di Grassi, who found himself right behind Vergne once again. But Buemi did not stay behind the German for long as he saw a gap and went for it, pushing himself past Abt again. The Berlin grand slam winner was not easy to shake off though and stayed right behind the Swiss Renault e.dams driver and took back his third place on lap 28. The second half of the race was all about the two intense battles at the front, namely between Vergne and di Grassi and Abt and Buemi. Nevertheless, Mahindra Racing driver Nick Heidfeld also put on a great show when he battled Mitch Evans (Panasonic Jaguar Racing) and Piquet JR for P6. But all eyes were on Vergne and di Grassi. The Brazilian clearly wanted to find a way past the Frenchman and he tried to use every little gap he could find – not without making some light contact with the race leader. But as much as he tried, in the end Vergne crossed the line ahead of di Grassi and Abt, but that was enough for Audi Sport ABT Schaeffler to win the teams’ championship. And di Grassi can also celebrate a very special victory: With his second palce today, he became the only driver in Formula E history to finish every single season within the top-three in the championship.